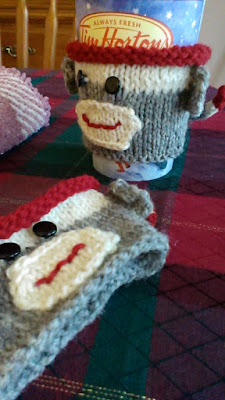 A friend of my teen granddaughter dropped a BIG hint to me last week... She said that she loves Caitlin's Sock Monkey coffee cozy. She said everyone loves it, even the teacher plays with the tail.... and she really wants one.. .... So later on I asked Caitlin if that was a hint.... Caitlin smiled and confirmed my suspicion. It was a BIG hint. I asked Caitlin if would like me to knit one for her and she can give it to her friend as a gift... She jumped at the chance... So I made a couple. I'm sure I'll find a home for the other one. They are friggy to make, but I don't mind on a small project. If you want to make for yourself, you can find the free pattern on ravelry. He is just too cute! I may have to try and make one. Thanks for the link. Very cute! I will definitely try to make one.